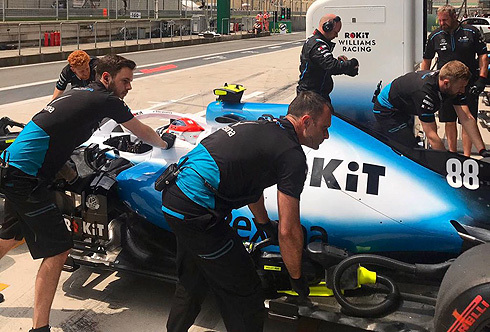 The final practice session for the 2019 Chinese GP would see no change in the situation for the ROKiT Williams Racing Team with both drivers again slowest of the field. Both drivers would complete two runs on the soft tyre with George Russell finishing just ahead of team-mate Robert Kubica. But theye would be 19th and 20th. Their final run on the soft tyre would be ruined by a red flag that would see the session brought to a finish. 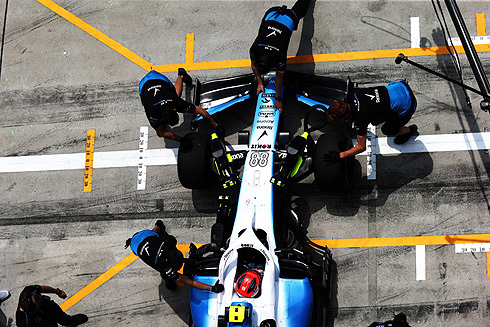 Qualifying is not going to produce any change in the fortunes of the Williams team. The Saturday practice would get underway with both Williams drivers coming out early and would be the first to set times. Leclerc would set the first representative time with a 1m:34.104. Vettel would move ahead with a 1m:33.222 with both Ferrari's on the soft tyre. Ricciardo was third running on the medium tyre. With forty minutes remaining more drivers would start to come out. Bottas was now second but Hamilton would move ahead with both on the medium tyre. Ricciardo and Hulkenberg were now 5th and 6th. The Williams drivers were slowest of the times set so far, which is not a surprise. Thirty minutes remaining and the order was Vettel, Hamilton, Bottas, Leclerc, Albon, Kvyat, Perez, Ricciardo, Stroll and Hulkenberg tenth. Verstappen would move into 5th. With twenty minutes remaining there was just Norris on the track. But both Williams drivers would return again on the soft tyre. They would improve their times but not surprisingly remained slowest. Other drivers were on soft tyre runs and Bottas would go quickest with a 1m:32.830 followed by Vettel and Leclerc. Hamilton would only manage fourth but the session would be red flagged after a massive crash with Albon. He would run wide at the final corner and would try to capture the slide but would end up going into the barrier. The session would not be restarted so the order was Bottas, Vettel, Leclerc, Hamilton, Hulkenberg, Raikkonen, Verstappen, Sainz, Albon, and Kvyat tenth. The Williams drivers would finish slowest. 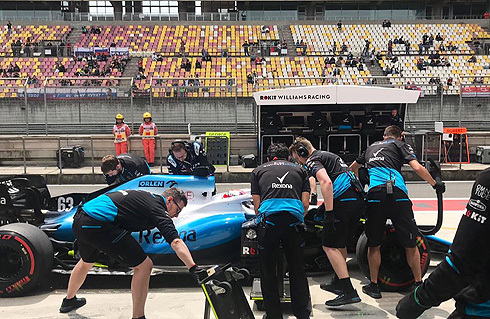 These races and practice sessions are more like test sessions for the Williams team as they struggle to get on top of their issues. Robert would be first out in the Saturday practice session running on the soft tyre. He would be the first to set a time with a 1m:37.220. Robert would pit after a five lap run. Robert would return for another soft tyre run and would set a 1m:36.176 which was an improvement but he was still slowest. He would pit after a four lap run. But he would join his team-mate back out for a further run on new soft tyres. But a red flag would see him having to pit ending his session. George would follow out his team-mate also on the soft tyre. George would move ahead of Robert with a 1m:36.630. George would pit after a four lap run. The team would be seen changing the floor on his car. It was not new one but it is a different design. George would also come out running on the soft tyre and would set a 1m:36.124. He would remain just ahead of his team-mate. George would pit but would return on a new set of soft tyres but would also be affected by the red flag.